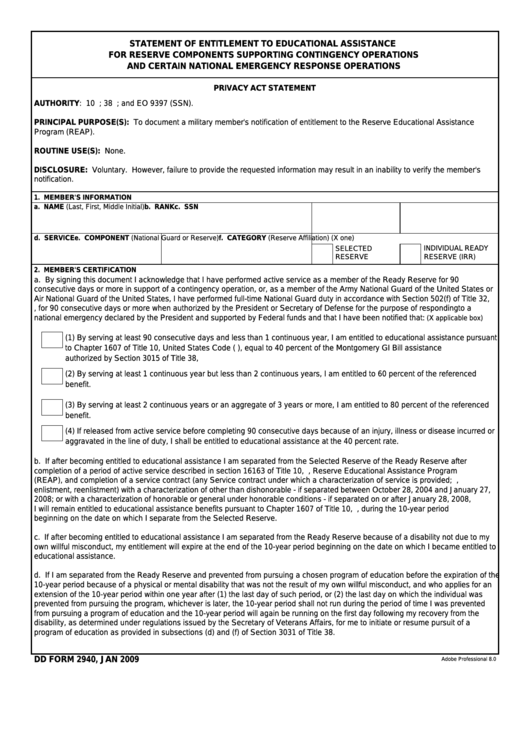 Download a blank fillable Dd Form 2940 - Statement Of Entitlement To Educational Assistance in PDF format just by clicking the "DOWNLOAD PDF" button. Complete Dd Form 2940 - Statement Of Entitlement To Educational Assistance with your personal data - all interactive fields are highlighted in places where you should type, access drop-down lists or select multiple-choice options. authorized by Section 3015 of Title 38, U.S.C. aggravated in the line of duty, I shall be entitled to educational assistance at the 40 percent rate. beginning on the date on which I separate from the Selected Reserve. program of education as provided in subsections (d) and (f) of Section 3031 of Title 38.